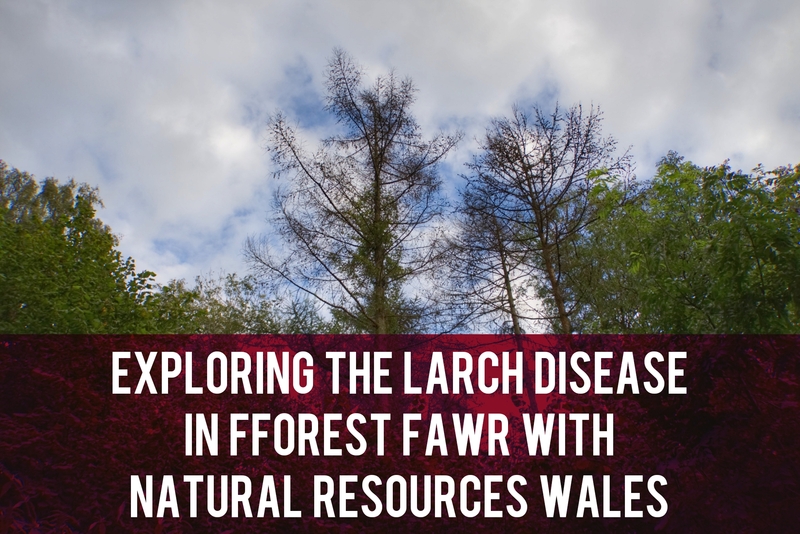 I was invited to explore Fforest Fawr with Martyn Evans, Senior Advisor Team Leader at Natural Resources Wales (NRW) to see how larch disease has spread through the local woodland. He explained how NRW are going to control the threat and manage the harvesting of the affected trees. We met at the gates to the castle and walked up the path that follows Heol-Y-Fforest towards the main car park by the sculpture trail. The first larch trees appear as we walk up the path and Martyn points out the telltale signs of larch disease. As we walk further I can see the difference in the undergrowth on opposite sides of the path. The left hand side has thick vegetation whereas some parts of the right hand side are clear and open. Martyn explained how the forest canopy affects the “understorey” and the potential for natural regeneration. Martyn lives in the area and spends a lot of time in the forest. He told me, “As a regular user of Fforest Fawr, I know how loved the forest is, and how important it is for local people, businesses and wildlife. It’s really sad that we have to fell the larch trees, but this disease is a serious threat to forests across Wales and we have to do everything we can to protect them. I’m confident that our plans for felling the larch, and allowing other native species to regenerate naturally, will ensure Fforest Fawr remains a wonderful place for locals and visitors to use and enjoy in the future”. When we reached the car park, Martyn showed me an example of natural regeneration. These young trees by the entrance to the main forest road are somewhere between 5 and 7 years old. The main forest road, that extends from the car park to the path down to the castle, will be widened by about 2 metres each side to allow access for the machinery and vehicles. Martyn explained, “The Fforest Fawr car park will not be closed while this tree pruning and preparatory work takes place and, in early 2018, the road will also be upgraded. The car park will be closed for up to two weeks when harvesting starts in September 2018.” You can see the tape that indicates where the bays for stacking the timber will be located. There’s no doubt that this work is going to have a big impact on the forest and feelings are strong. There are 1,800 signatures on Anna McMorrin’s petition to replant and restore the trees. There is a public meeting arranged for Monday 9th October at 7:00pm in the village hall. Representatives from Natural Resources Wales will be in attendance to answer any questions you have. You can get in touch with Martyn on Twitter. You can email Natural Resources Wales or get in touch via Twitter and Facebook. I asked Martyn to send me some information about the forest and their plans for the work. 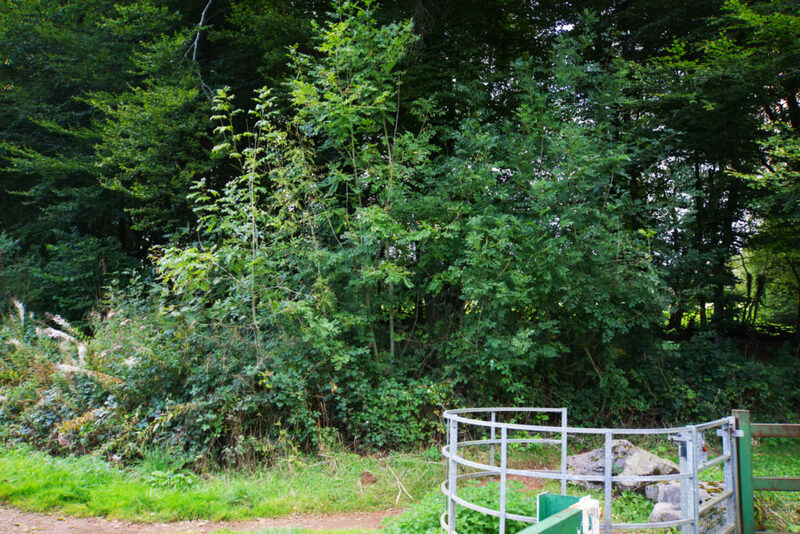 Fforest Fawr is a mixed ancient woodland that covers nearly 105 hectares – almost 260 acres. This is equivalent to approximately 130 football pitches. The total area of larch at Fforest Fawr covers approximately 50 hectares, which NRW has been instructed to remove. It is important to note that we will not remove all trees from this 50 hectare area. We will only be removing the larch trees; we will be retaining the layers of shrubs, trees and vegetation beneath the main canopy. This means that our planned operation is more akin to thinning rather than clear-felling. We have divided the area into two sections (about 25 hectares each). The first section will not be felled until September 2018. The remaining section will be felled in September 2021. In order to facilitate the forest operations, we have scheduled tree pruning this year. This will take place two metres either side of the forest road that runs through Fforest Fawr. This tree pruning will enable us to upgrade the road in January 2018. We will ensure minimal disruption where possible to all forest users and we will put up information boards and other signage to keep people fully informed. Timber from infected larch can still be used, so the felling provides us with an opportunity to recover some of the economic value of the timber that is subsequently reinvested into Fforest Fawr and other Welsh Government Woodland Estates. Natural regeneration is the process by which trees and woodlands are established from seeds produced and grown in situ. Natural regeneration is already taking place in many sections of Fforest Fawr (beech, oak, birch, wild cherry, rowan and hazel) owing to the presence of a good understorey, and good seed sources. As a result we will try to allow time for natural processes to take place. We hope this will provide huge benefits to wildlife and biodiversity, conserve local species and create more diversity and resilience within the forest. This approach is in line with current policy and guidance on restocking, restoration in ancient woodlands and species diversity. 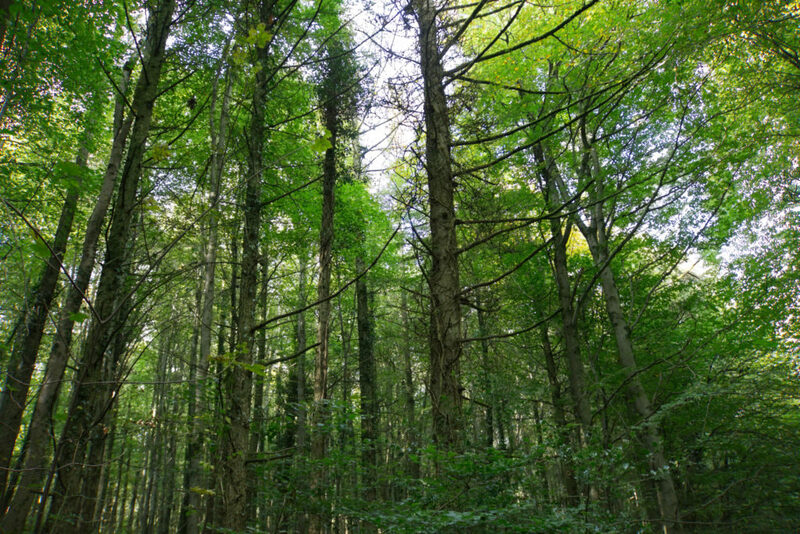 Natural regeneration can be managed by combining natural self-thinning in the early stages with selective “respacing” to favour the best quality trees. NRW will monitor the regeneration in the forest over the following years before considering if any replanting is required. If we do not get the required species and density of trees in sections of the site, then we will look to restock these areas. We want to bring more woodland into management in Wales, increasing its value to our communities, economy and environment. While we will temporarily lose trees in Fforest Fawr, our work will serve as an opportunity to look at existing recreation infrastructure and we are very keen to work with community groups to maximise the use and enjoyment of Fforest Fawr. We will also update the sculpture trail. Update 23/9/2017: Article edited to correct information about closure of car park. Thank you. This is very informative and reassuring…I think!